Teach Seniors Technology is a non-profit organization registered with the Secretary of State, California and is 501(c)3 certified. TST was founded in 2013 and seeks to educate seniors about technology through teaching them about social networking, surfing the web, and operating the basics of computers. This program is run by student volunteers who have a passion to teach technology and give back to the senior community. TST is an international organization with chapters in South Korea, Canada, China, India, Singapore and U.S.
We are always looking for new members and / or chapter heads. Please contract us if interested and starting your journey of making a different in enriching seniors' lives! 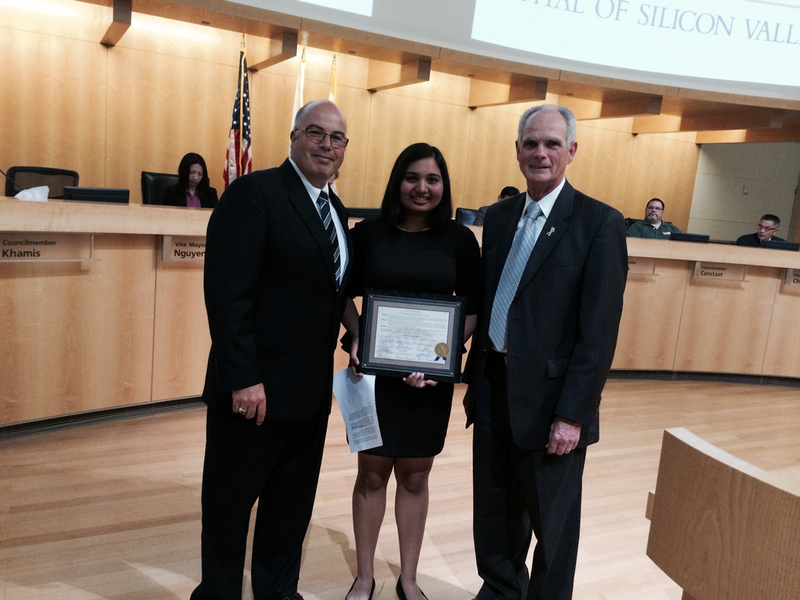 Stuti Vishwaban (TST founder), along side Chuck Reed (right), ex-mayor of San Jose, and Johnny Khamis (left), San Jose council member.